Learn IELTS Vocabulary by watching TED talks. 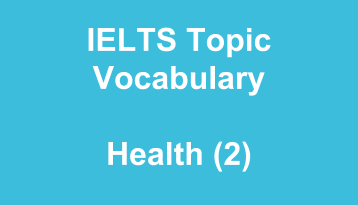 Key terms, collocations and even possible Task 2 questions are listed. Listen to this great talk on food production and consumption, write down what you learn, try to summarise what he says. What would be the essay question regarding this topic? Over the last 100 years food diets have changed considerably. Some argue we have sacrificed health over convenience, others say we are have the richest diets ever. What do you think? Give reasons and examples to support your answer. Collocations: family dinner, global warming, energy production, health crisis, food pyramid, organic food, disease reduction.